This International Nurses Day the WeObservatory has launched Tea the Duckling, the diabetes educational video for children, their parents and their teachers. The story is identical to the one of Teo the Duckling , but the main character in this video is a girl – Tea. It might not be the case for everyone, but for some little girls it is important to associate themselves with a girl character, therefore we decided it’s important to create two versions of the story – Teo and Tea. The photo on the right: launch of the video made during the International Nurses Day in Paris with the Connecting Nurses team. 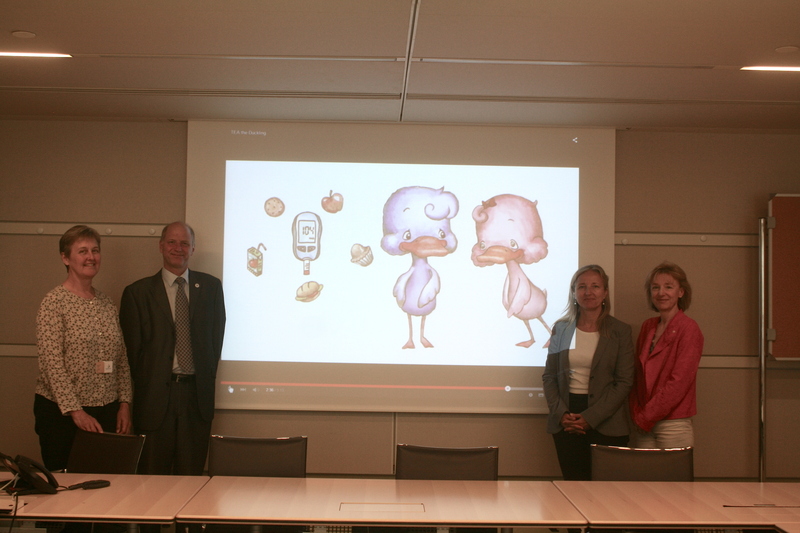 From left to right: Felicity Kelliher, nurse and educator (@dk_felicity), Nick Hardiker, director of the eHealth program at ICN (@nickhardiker), Tea the Duckling , Sylvie Coumel of Connecting Nurses and Dr. Véronique Thouvenot of the WeObservatory (Millennia2025Foundation; @Vthouvenot). Also, the author of the Teo the Duckling story, nurse Norma Grau participated in the round table discussion in Spain as part of the international digital event organized by Connecting Nurses in honor of the International Nurses Day (photo on the right). The video of this discussion is available on youtube.